The Okinawa City Zoo is a fun place for kids and adults, with plenty of animal action to present an enjoyable afternoon visit. There’s much more to this childrens’ oasis, as zoo operators unveil a new service at Okinawa Childrens Land. They’re calling it “Mobile Street”, and have even given it a nickname. It’s the new IC media attraction, designed to help kids think and to find that learning new things can be fun. The new service is a product of Hot Station Okinawa Co., Ltd., which has developed an “RFID Tag” using IC media and a computerized system terminal allowing its use outside. PDA’s, pocket type computers, have become popular in the business world, and now are finding their way into new applications. At the Children’s Land, part of the zoo complex, the idea is an exciting orientation game that involves the youngsters partidcipating to find where the RFID Tag is hiding inside Children’s Land. 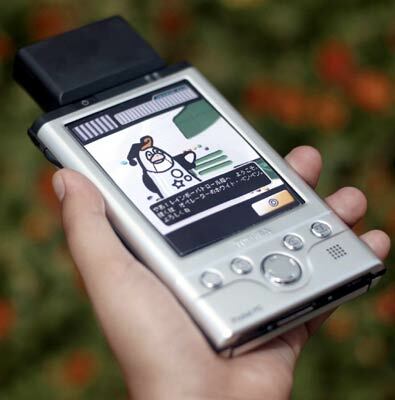 When the visitor arrives, he or she is given a PDA unit in order to play. Hints show up on the PDA screen to give players a chance to search for the RFID Tag. Each hint tells something about the tag. As the youngster passes from point to point within the park, there are opportunities to play the hints and to get right answers. Right answers lead to further hints. The more knowledge, the more points. Time is a factor too, with 60 minutes the playing time limit. The computer never gets tired, so random hints and questions keep coming. Game contents vary, with one example being “Rainbow Patrol Center. The goal is to have the computer ask famous characters for help, while the player protects the Rainbow Land. Depending on the quality of the answers, the player moves forward, attaining higher rankings. As in an video or computer game, the challenges are many. The Children’s Land units are bilingual, and also prepared for use with handicapped persons and those with hearing impairment. The programs were designed in cooperation with an industrial arts laboratory. The idea is to tap childrens’ inventive power in front of real animals, while instilling experiences that provide special studies and information retention. Games can be played alone, or in groups visiting the Children’s Land. Rainbow Patrol Center will focus on kids ages 7 to 14, with three levels of difficulty. There’s also an IT Room where scores can be checked, rankings noted, and printouts made of results. There are fees to participate in the new service, but they’re nominal. A ¥500 charge covers first time use, with PDA rental another ¥500. 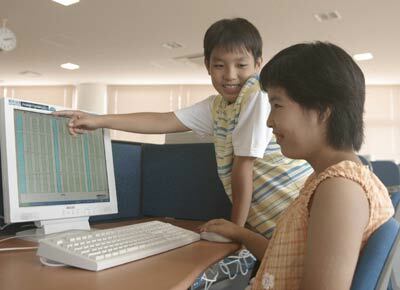 Use of the computer within the IT Children’s Center is ¥100. 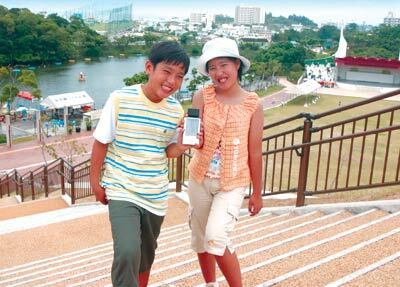 Information and reservations are accomplished by calling Okinawa Children’s Land at 933-4190. Reservation name lists can be sent via fax to 932-1634. The Okinawa City Zoo and Children’s Land is located several kilometers from Goya Crossing near Kadena Air Base. From Kadena, travel down Gate 2 Street, across Goya Crossing. As you pass Koza Baptist Church on the left, turn right. Follow the signs the last several blocks. Coming north on Highway 330 from Camp Foster, turn right at the intersection before Goya Crossing and the Police Station. Travel 740 meters, and you are at the site.